For the true collector, our elite series of golf ball display cases and cabinets, personalized with your name in custom, hand-stitched embroidery for a unique and personal gift for the niche golf ball collector. Made in the USA from real oak wood, these golf ball displays are shipped to your door ready to mount. The soft foam backing firmly holds in place your collectible golf balls, and the hand-embroidered golf logo is a gorgeous adornment. These cases are generally shipped out within 5-10 business days for a timely gift idea. Choose Honey Oak, Cherry, or Dark Walnut finish for the wood frame, which is made from 100% oak wood. logos measure 4” x 4”, while the “Crossed Clubs” logo measures 4” x 9”. 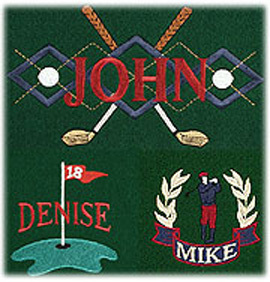 The size of the embroidered logo will affect how many golf balls each cabinet can display. These displays can be ordered in three sizes: Small, Large, and Extra Large. 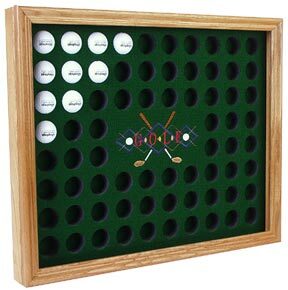 The Small cabinets hold between 8 (depending on logo size) and 16 (with no logo) collectible golf balls, while the Large holds between 28 and 36. The Extra Large golf ball displays hold up to 80 collectibel balls (with no logo). Additionally, these items can be purchases with or without a Lift & Slide protective plexiglas shield. The cover protects the golf balls from dust and other disturbances.